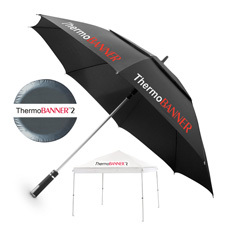 ThermoBanner™2 exhibits great durability with a polyester backing for easier weeding. This product is great for awnings, permanent banners, umbrellas, tire covers and flexible truck side coverings. It offers excellent outdoor durability.! This material requires very little pressure and can be used with a hand iron or standard heat press.